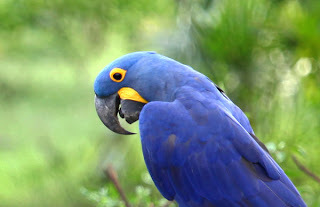 What is the Pantanal exactly? My local guide in Brasilia, who has never been, thinks it is part of the Amazon with thick rainforest and lots of rain. Is it the jungle? No. Is it even part of the Amazon? Not exactly. 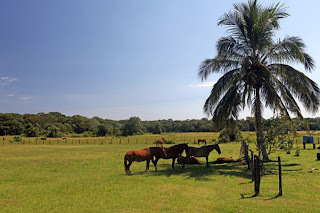 The name "Pantanal" comes from the Portuguese word pântano meaning wetland, bog, marsh or swamp. The Pantanal of Brazil is it's own ecosystem entirely, and makes for the largest wetlands in the world. 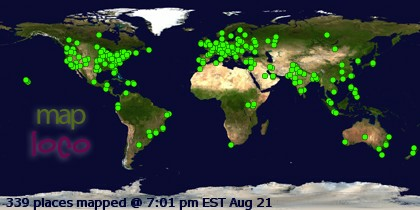 So here it is the end of the rainy season, and the Pantanal should be flooded, right? I prepare for muddy roads, puddle filled trails, fording knee-deep through muck, getting soaked, all that. Another year, perhaps. But not this year. 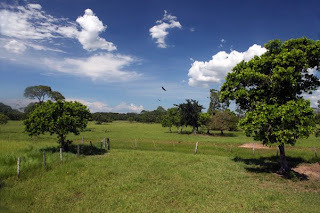 The rainy season of 2008/2009 so far has been the driest on recent record in the Pantanal. The roads are dusty, not even a puddle; the air is scorching hot, no raincloud or raindrop in sight. The water level is so low that our lodge, which is supposed to look out over flooded plain and wetlands, instead looks out over dry brush, not even a waterhole to be found. 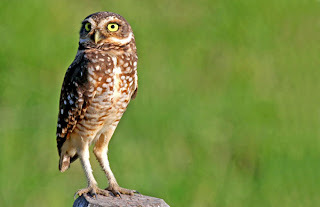 The climate is changing all over the world, and quite notably for the animals of the Pantanal. 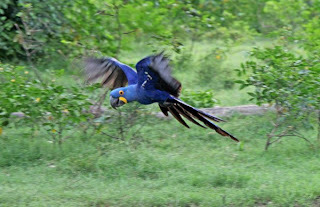 The Pantanal adventure begins with the drive to the remote Cordilheira Lodge at the Caiman Ecological Reserve. 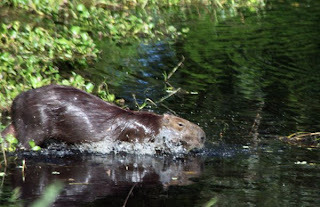 The first sighting is a good one - the Capybara, the largest rodent on the planet. Awfully cute for a rodent. 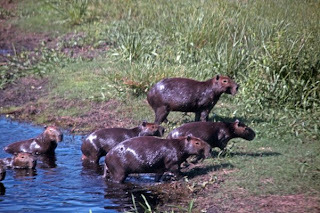 Especially when the whole family appears, adults and little ones, splashing in and out of the cooling waters of a river. And just a few feet away, what's that? Caiman?!! Yep. Interestingly enough, caiman and capybara co-exist peacefully. Caimans just aren't interested in expending any energy to chase down a big furry rodent. Instead, they can get a delicious seafood meal by just sitting in the cool water with their jaws open as the water flows over the rocks. They are not drinking. They are simply waiting for a fish to come tumbling into their mouths and snap, how easy is that? 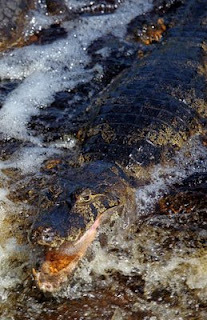 I've yet to see a caiman without a smile. They all wear a big ear to ear grin in fact. What's to complain about? Here they are living in the protected wilderness of the Caiman Ecological Reserve, in the heart of the Pantanal - best life to be had for these reptiles! 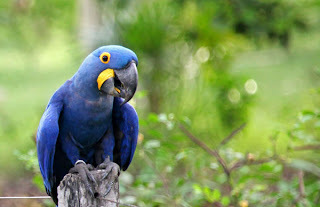 Perhaps the Pantanal is best known as prime habitat for the Hyacinth Macaw. A visit to the rescue/rehab center doesn't guarantee a sighting. In fact, only the empty nest box stood as evidence of their existence. But when you least expect it, there it is. In the wild. And it is beautiful. THEY are beautiful. 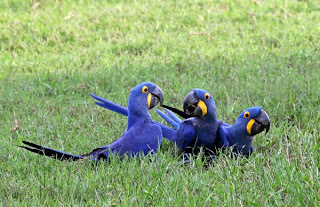 To watch these gorgeous Macaws in their native habitat is utterly amazing, and the true highlight of a visit to the Pantanal! That's great and all, but what about the jaguar? I never saw it, but it more than likely saw me. 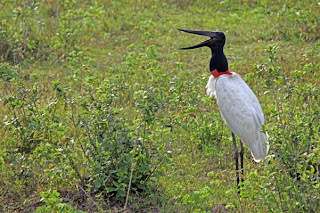 They are quite rare to catch a glimpse of - the guide had only seen one four times in the past five years at the Pantanal. But the other guides told an interesting story about the jaguar and politics. Apparently, the jaguar is a big fan of Obama, as it chose to make an appearance on Election Night 2008. A group of Americans were staying at the Lodge, and glued to the satellite tv to watch the election coverage on November 4. When it came time for the safari outing, only a Danish couple broke away from the media to get out in nature. And guess what. Only the Danish couple was graced with the sighting of a jaguar. They missed a few hours of Obama and McCain on tv, but they saw a jaguar in the wild, they watched it, they took pictures, and everyone else missed it. So the Danish couple, along with everyone else, still get 4 years of watching the media cover Obama. But everyone else, unlike the Danish couple, missed a once in a lifetime opportunity to see a jaguar in the wild. So the lesson is this: given the prospect of choosing between two once in a lifetime events, go for the one that CNN doesn't cover! 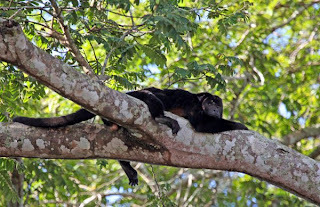 But there are other mammals to be discovered in the Pantanal, such as the Howler Monkey, and the Crab-Eating Fox. 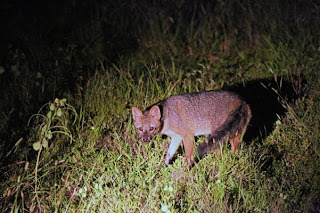 By the way, for those of you who winced at my earlier post about all the mosquitos in the Pantanal, let me just say that the joy of watching wildlife in the wild, zooming in on a Savannah Hawk in perfect light, or getting video of caimans gliding with capybaras in the rivers, well, moments like these make it all worthwhile. Yes, it's incredibly buggy, but the bites go away....the memories last a lifetime. That's it from the Pantanal. 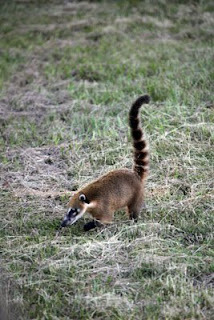 For more captivating images of the Pantanal lodges and wildlife in the wild, visit Mira Terra Images. Wow. I'm jealous. Your pictures are fabulous!